Female winners of the Nobel Peace Prize are still rare enough that when the 2011 award went jointly to three women, the news was hailed far and wide as a victory in the global fight for women’s rights. By coincidence, this triumph on the world stage lends poignancy to the play currently running at Burlington’s FlynnSpace. Vermont Stage Company’s season premiere, Anna Ziegler’s Photograph 51, chronicles a watershed moment in modern science that eventually led to a jointly awarded Nobel Prize — but not for a woman instrumental in that breakthrough. Director Jim Gaylord’s cast drew the audience immediately and authoritatively into Photograph 51, as if we were idle lab assistants awaiting instructions. Four of the six players (those not playing Yanks) affect English accents, establishing an atmosphere of fussy propriety tempered with wry British wit. The accents are, by and large, convincing, although on opening night, Alexandra Hudson, who plays Franklin, sometimes required a beat or two at the top of the play’s later scenes to get her voice in tune. Otherwise, Photograph 51 began in confident midstride with the actors energetically embracing the trials before them. The pressure to maintain professional decorum while pursuing the Holy Grail of genetics adds a special layer of tension to otherwise ordinary exchanges in Photograph 51, and the VSC production quickly brings that tension close to boil. Hudson’s Franklin arrives at her new lab to learn that the details of her work have changed without her notice or consent. Her unflinching assertiveness fixes the play’s central conflict in place. Wilkins (Bruce Campbell), the senior fellow on the DNA dream team whom Franklin was hired to “assist,” finds himself suddenly on the defensive, blindsided by a woman of uncommon boldness. He quickly revises their working arrangement to an equal partnership. Campbell walks a fine line between conciliatory and confounded as Wilkins tries to build a pleasant working relationship with Franklin. Lane Gibson Jr. plays their unfortunate mediator, PhD candidate Ray Gosling, in the play’s most humorous role. Photograph 51 takes place in multiple time frames that are deftly evoked through understated production values. The main story begins with Franklin’s arrival at King’s in 1951. On scenic designer Jenny C. Fulton’s spare set, the actors move wheeled lab tables about when the scene shifts cleverly from this time-bound narrative to a kind of Old Boys’ Club beyond the fourth wall. In this latter mode, fixed in no particular time, the male actors share contrasting recollections of how events played out. A wall-sized projection of a DNA strand photograph — Franklin’s primary work — similarly works to contextualize the story. The result is a fluid, briskly paced piece of theater that turns dull laboratory work into riveting drama. In a play where the high point of physical action is a firm handshake, this is a noteworthy accomplishment. Fulton’s costumes also deserve mention for giving a certain style to the straightlaced look of postwar academic culture; her choices fit their period without drawing too much attention. Verisimilitude is important in Photograph 51, as it sets the scene for characters to explore how their work affects — and becomes — their identity. The emotional stakes are highest for Franklin, who is stigmatized for being a single woman in a male-dominated field. That she is also Jewish offers her peers another rationale for disliking her. In her VSC debut, Hudson carries the role with plausible British stoicism and offers only microflashes of emotion to illuminate the lonely human being inside this sphinx. Whether the role calls for more expressiveness is an acting and directorial choice, and Hudson has proved herself a versatile performer elsewhere. Her relentless guardedness in Photograph 51 conveys the challenges confronting a woman like Franklin, but it also leaves one wanting to become better acquainted with her. 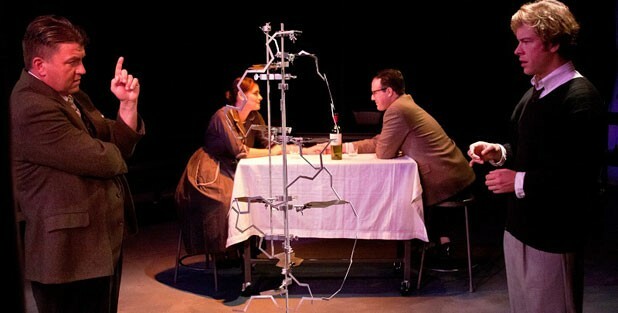 This desire to know Rosalind Franklin is precisely what drives Wilkins to distraction and — at least in the play — tacit betrayal of his lab partner. Campbell turns in a fully realized performance. As Wilkins’ ego takes a beating, he evokes sympathy for his character while personalizing the race to discover the structure of DNA in fascinating, infuriating ways. That one may feel sorry for the man who sold out Rosalind Franklin is a testament to Campbell’s acting skill. Supporting players round out this solid cast. Playing lab assistant Gosling, Gibson performs the role of lackey-narrator with charming, comical self-deprecation. As Francis Crick, John D. Alexander uses his stentorian voice to give his character an avuncular stodginess that stops just short of pompous. As James Watson, Benjamin Wiggins is the impetuous young prodigy out to make a name for himself in stereotypical American fashion — on someone else’s back, if need be. Wiggins’ portrayal may be a stroke too broad, his childlike fidgetiness a bit conspicuous, but he injects the play with humor that contrasts with his staid English colleagues. Playing Franklin’s admirer — and eventual assistant — Don Caspar, James Blanchard is the one person on stage to express unqualified appreciation of Franklin’s gifts. This is the smallest role in Photograph 51 but an important one, as Caspar bears witness to the story’s saddest conclusion. It doesn’t have to be Nobel Prize season for the VSC production of Photograph 51 to be poignant. For we know that, as surely as the fight for women’s rights rages on, the motivation to omit Rosalind Franklin from a momentous chapter in the history of science hasn’t disappeared from our collective DNA. The universe under the microscope in Photograph 51 reveals — in captivating detail — secrets of life that merit more rigorous reexamination.